January 25 2018 Scanners to 'reduce risk' of children being left on school buses. More than 440 Victorian school buses will be fitted with scanning devices in a bid to stop children being forgotten inside them. The move comes in response to a number of children being accidentally left on buses, sometimes in hot weather. More than 440 school buses in Victoria will be fitted with scanning devices. Photo: Ryan Osland . In a move to prevent this potentially fatal error, the Victorian Education Department will pay for the devices to be installed on buses that transport students to special schools. The technology will require drivers and supervisors to walk to the back of the bus and scan a card reader after inspecting the aisles for children following a school run. Education Minister James Merlino. Photo: Ellen Smith . It also records when students have boarded and disembarked – data that can be accessed by parents and schools. Some bus providers will roll out technology that will let parents and teachers see the exact location of the bus as students are ferried to and from school. Victorian Education Minister James Merlino said the measures would strengthen the safety of students. “We take our role in managing transport assistance very seriously and these new measures will further strengthen safety for students accessing the program,” he said. It is understood the state government began investigating the new technology after a 7 yo boy attending Monash Special Developmental School was left on a Crown Coaches bus on a 31 degree day in 2016. The boy was discovered in the afternoon, when the bus left the depot for the school pick-up run. A similar incident occured in 2015, when a child from Bulleen Heights Special School was locked on a school bus for more than five hours after falling asleep. Bus Association Victoria executive director Dr Chris Lowe said he was aware of five incidents over the past decade involving Victoria children being left on school buses. Four of these incidents involved students attending special schools. Dr Lowe said bus drivers and supervisors were required to check buses for children at the end of their run, but in a few rare instances this had not occurred. “Nothing is fail-safe because drivers are human, they forget to walk the bus at the end of the shift,” he said. “We hope that the technology we are embracing will further reduce that risk. It accurately tracks who is doing what, where and when." Helen Hatherly, the president of the Victorian chapter of the Australian Association of Special Education, said she supported the initiative and that it should be expanded to all schools. She said the technology would benefit all students who attended mainstream schools. Earlier this week, a 5 yo Queensland girl was left on a school bus for 5 h after she should have returned from school, sparking a frantic search by police. She had fallen asleep on the bus after her first day of school. Sunbury Bus Service #31 (Scania L94UA/Volgren) is running the 12:22pm route 487 to Killara Heights today. I also noticed this trip being operated by an artic yesterday so perhaps this is now a regular thing. Last time that I observed artics running regularly in the off-peak was in 2014. Bacchus Marsh Coaches #25 (Volvo B7RLE/Volgren Optimus) operated the 18:10 trip on route 485 from Sunbury to Wilsons Lane tonight. First time that I have ever seen a PTV liveried bus on route service in that area. Perhaps some Sunbury low floors on Commonwealth Games duty ?? Kastoria are running Toyota Coasters on route 476 between Watergardens and Plumpton today, departing from the Sydenham Rd side of the station. 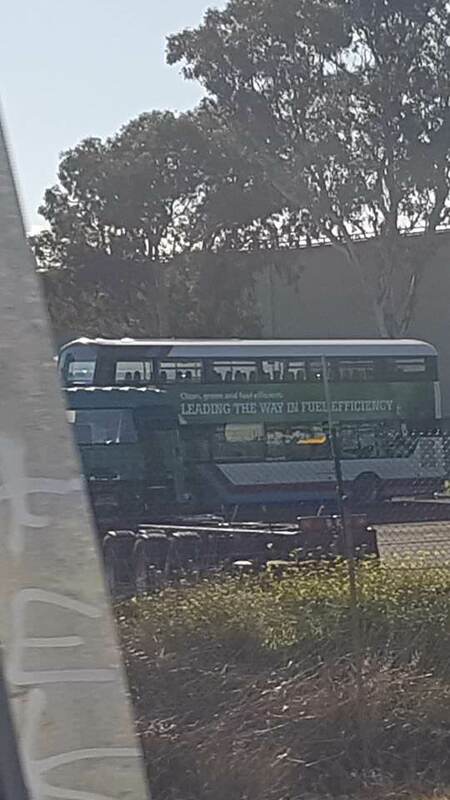 I wonder if part of the reason is the significant number of buses they have currently on the Hurstbridge railway bus replacement services? Almost all of the buses I saw on Friday were either Sita or Kastoria. But being a Sunday be less buses needed for route and maybe for rail. I was thinking reason might been due works on Melton Highway level crossing today. So like split route into 2 and used mini buses on short half from Watergardens to Plumpton. From observations the vast majority of trips on the 476 could easily be handled by a Coaster's seating capacity. But being a Sunday be less buses needed for route and maybe for rail. I was thinking reason might been due works on Melton Highway level crossing today. So like split route into 2 and used mini buses on short half from Watergardens to Plumpton. You're probably right. Has the route been split in 2? I would have thought it would have been possible to deviate around the crossing via Kings Rd and Sydenham Rd - both are shown as green on the Vicroads Controlled Bus Access map. During Transdev Crisis they had up to 20 buses on loan with no issues to their own service. As for 476 being split during Melton Hwy Level Crossing works? Was nothing on ptv site but there been many times before where disruptions not been put online. Noticed yesterday whilst I was driving through Drouin was a local town bus showing the destination of "WGL Stn to DRN Stn". Didn't see which route number it was on. The Andrews Labor Government is making it faster and easier to get in and out of Eltham and neighbouring suburbs, with a massive new upgrade to Fitzsimons Lane. The works will be part of the Suburban Roads Upgrade – the biggest investment in suburban roads in Victoria’s history – to fix 22 key suburban arterials and create more than 4,200 jobs. All lanes will be opened to traffic between Porter and Foote Streets and there’ll be major upgrades to key intersections, slashing travel times and increasing peak hour travel speeds by more than 50 per cent. The roundabouts at Main Road and Porter Street will be replaced with traffic lights and existing traffic lights at the Foote Street intersection will be upgraded to improve reliability for drivers. The traffic lights will improve the efficiency of these intersections and will be able to be controlled in real time to better manage traffic flows. The existing bus lanes will be removed between Porter and Foote Streets allowing all lanes to be opened to all traffic. SPIN,SPIN,SPIN.Wait for it-there will be more to come from both sides,eager to bribe their way into power !!! Nice to take a ride in Simcocks Hino/Autobus manual last night on the 1244am Carrum to Frankston Rail last night. In other news large amount of Driver Buses in Use this morning on Carrum to Frankston shutdown also. Other than Dysons, CDC, Ventura and Deluxe Coachlines just about everything I saw was a foreigner. Including those already mentioned plus Kanga, Grants Coaches, S & R coaches, Simes Bros, Purtills, Bendigo Coachlines, Trotters, Rover Motors, Hutchisons, Fords, North Sydney Bus Charters, Australia Wide Coaches. The list goes on!! Fascinating Andy.Might be up for a trip to check this out !! Obviously availability of Melbourne based buses in school term is the reason.Any ideas of the number of vehicles operating at peak on it ?? I have heard the figure of 180 buses were ordered with cold reserve of another 20 or so if needed, which a source suggests might have already started to have been called upon after traffic delays and heavy loadings this morning. The elephant in the room was no Sita or Kastoria buses seen - guess the ongoing contract dispute with the government might be to blame? Guess that might answer who will do the 86 tram replacement along Smith St on Monday though. Thanks Craig.Sita/Kastoria normally have good vehicle availability.You might be right re the 86 replacement. burrumbus wrote: Obviously availability of Melbourne based buses in school term is the reason. Another reason too would be because the Frankston/Stony Point lines were originally scheduled to partially re-open this week, which would have reduced the section needing bus replacements to being only between Kananook and Leawarra, but instead trains are still completely suspended beyond Carrum. This double decker is parked out the back of one of the factories near the rail line near the progress street crossing. No idea where its going.